Between the years 1780 and 1792 François Dumont established his reputation as the most sought-after French miniaturist. He painted portraits of the Queen from about 1777 onwards and, after a period of study in Rome, in 1786, became official Court miniaturist following death of Ignazio Pio Vittoriano Campana. In 1788 he was received into the Royal Academy of Painting and Sculpture and from 1789 exhibited regularly in the Paris Salon. In 1790 the King granted him an atelier-apartment located in the Galleries of Louvre which had become vacant after the death of the engraver Charles Nicolas Cochin. According to Olivier Blanc Dumont, along with Kucharski, was the artist of Marie-Antoinette's "mauvais jours". He never hid his royalist sympathies and was imprisoned in the Abbaye prison at the end of 1793, to be liberated only after the fall of Robespierre. He continued to occupy a place in salons of painting from 1789 to 1824 though his work was overshadowed after the Revolution by that of Isabey and Augustin. 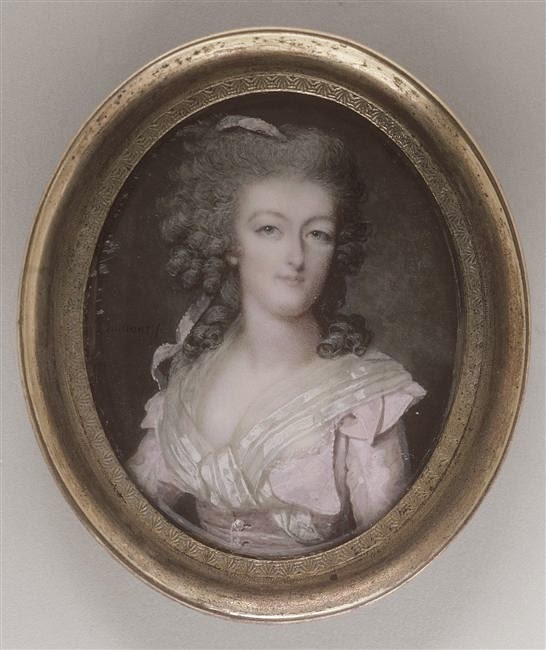 A catalogue raisonnée of Dumont's work, compiled by Southeby's expert Bodo Hofsetter, was published in 2008; without this Dumont's miniatures of Marie-Antoinette, many of which are now in private hands, are difficult to trace. Here are a few of the better documented examples from late in Marie-Antoinette's life. Dumont, portrait of 1784. Miniature on ivory. This portrait from the Cleveland Museum of Art, mounted on a little snuffbox, shows the black ruff which is mentioned. According to a biographical notice in the Gazette des Beaux arts for 1903, Dumont borrowed this "collerette" and also a coral necklace of Marie-Antoinette's to copy in his paintings - in the early 20th century both were still in the possession of the former owner of the Louvre miniature, Henri Gillet. 2. The catalogue of the exhibition Marie-Antoinette et son temps held in Paris in 1894 records a Dumont miniature given to Madame de Tourzel and at that time in the collection of her grandson the duc de Cars. The queen is depicted facing and from the knees upwards. She is holding flowers which she is arranging in a vase. 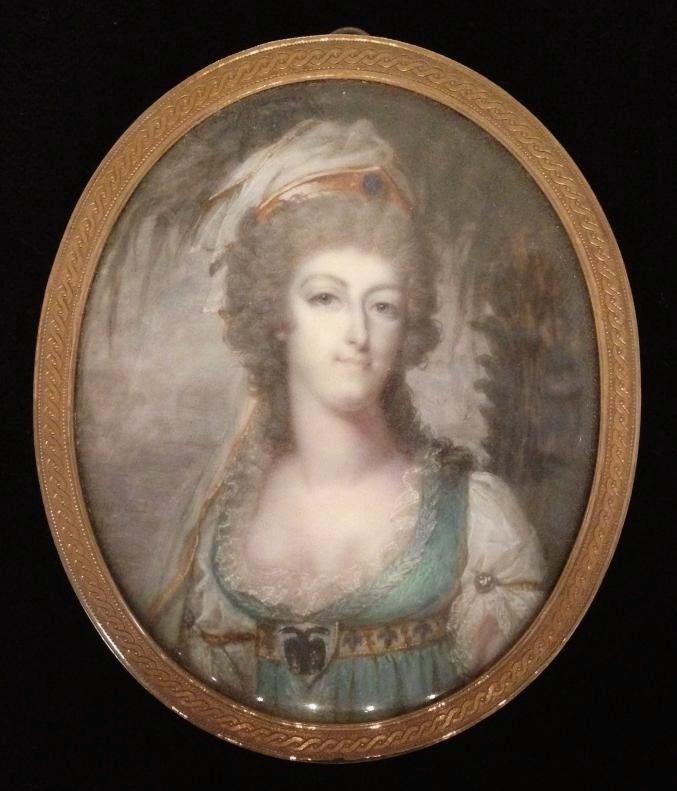 This miniature is said to have been painted in 1790. The comte de Reiset, in his edition of the journal of Marie-Antoinette's dressmaker Madame Éloffe, also mentions a portrait "from the early days of the Revolution" which was given to Madame de Tourzel (vol.II, p.287). 3. 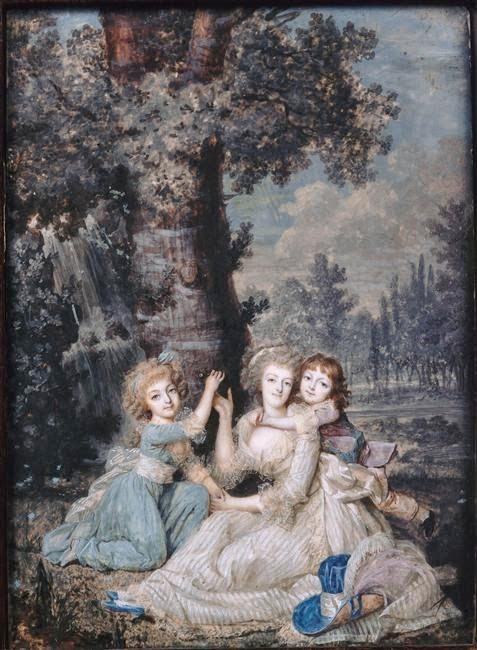 The Louvre holds a larger rectangular portrait showing the Queen with the dauphin and Madamee Royale, which is recorded as having been delivered to the Queen on 29 January 1790. This picture was probably commissioned after the event as a memory of one of the last days of freedom passed by the family in Saint-Cloud. The Queen is seated at the foot of a tree in a rural setting wearing a white silk dress with toned stripes and, on the ground to her right ,is a blue hat with red and white feathers. The blonde Madame Royal is in a blue dress and the dauphin, who clings to his mother, is dressed in a red jacket and yellow trousers. on the grounds of its likeness to the family portrait. 4. Marie-Antoinette had herself painted, probably in 1791, as a vestal, standing next to an altar (identified by Olivier Blanc as a altar to amitié) and holding a vase of lilies with an image of Louis XVI. The pose is a standard one, though it may have been chosen to echo French Revolutionary imagery; certainly the fleurs-de-lys are an obvious royalist emblem. It is possible too that the picture portraits the more personal theme of conjugal love elevated into passionate friendship. 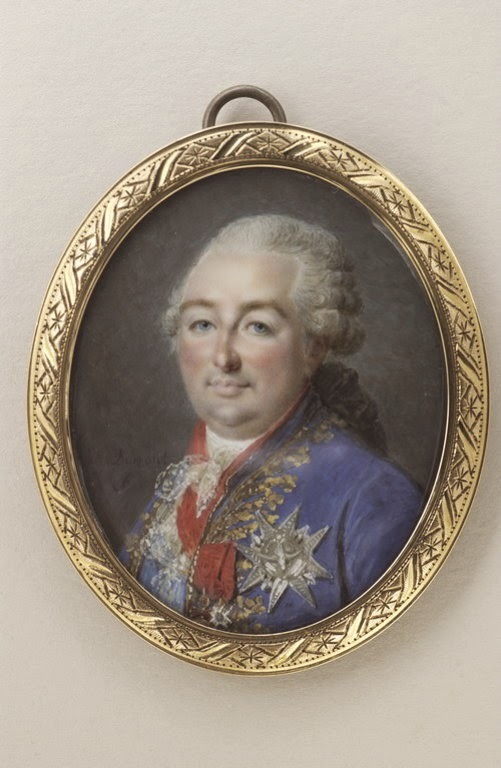 Louis XVI was fond of the picture; according to Marguerite Jallut the original gouache stood on his bureau in the Tuileries, whilst a smaller copy accompanied him on the flight to Varennes. The only version of this work now publically accessible is an engraving by Pierre-Alexandre Tardieu, begun in 1793 but only completed in 1815, having been interrupted by the Revolution. According to the Louvre database the gouache was formerly in the Collection of the duc de Mouchy and the miniature copy sold by Drouot in 1991. The books by Marguerite Jallut and Olivier Blanc have reproductions of what are obviously the two different versions, though which is which is not entirely clear! There are several miniatures clearly based on this pose, some of which date to as late as 1815.. Compare too, this portrait by Frédéric-Jean Schall, of the Queen "en vestale". 5. 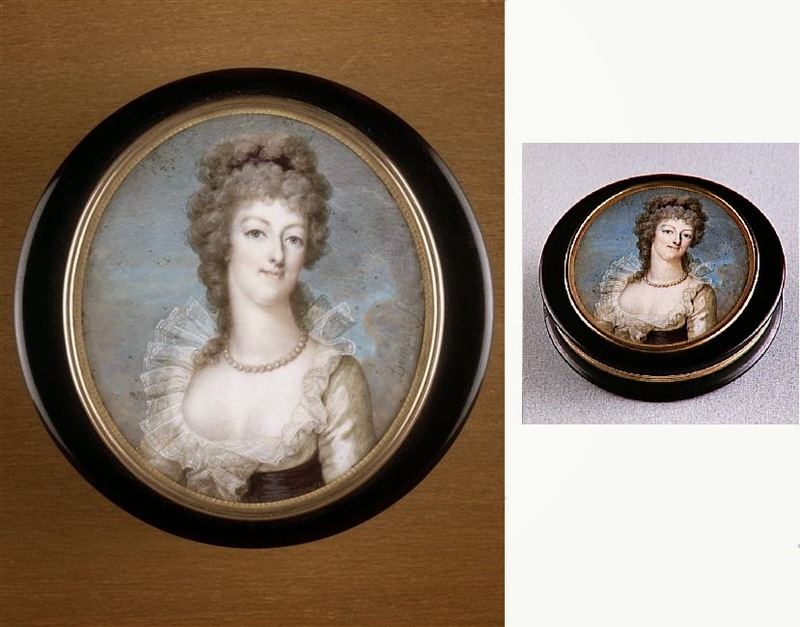 Olivier Blanc identifies as Dumont’s last portraits two miniatures dating from the spring of 1792: "The queen, still smiling, wears a white dress, in one with a light coloured belt and in the other a dark one". The portrait below, with a light belt, is annotated as having been painted in April 1792 and sent to the duchesse de Fitz-James. 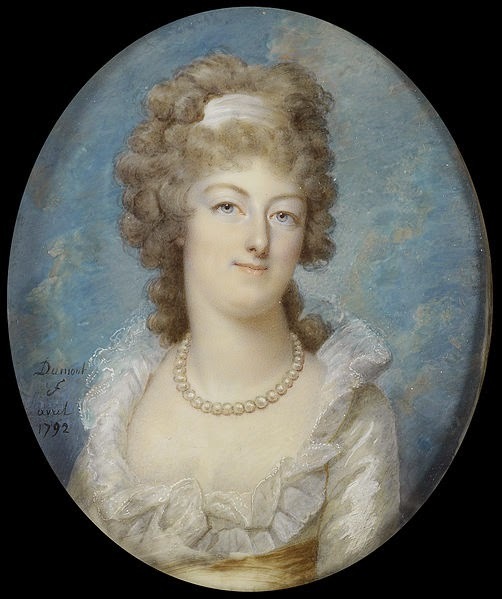 (see Reiset II, p.287: "At the beginning of 1792 the Queen had a miniature painted (by Dumont) and sent to her former lady-in-waiting the ducesse de Fitz-James." The similar portrait with a dark belt can be found at Versailles. 6. 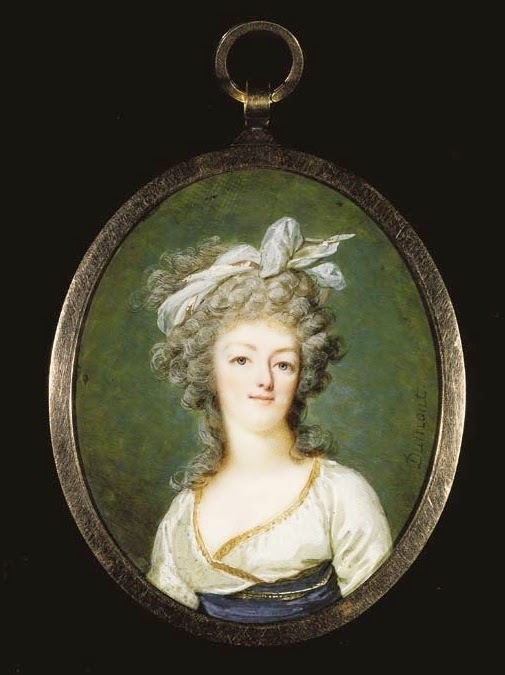 Olivier Blanc also mentions a portrait sent to the comtesse d'Artois in Turin in 1792, now in the musée Lambinet, which features Marie-Antoinette with a blue belt, unpowdered chestnut hair and her elbow on a console. He includes this illustration; the informal dress, slightly less finished quality of the work (or maybe the reproduction) give this picture a more sad pensive quality more fitted to the circumstances. 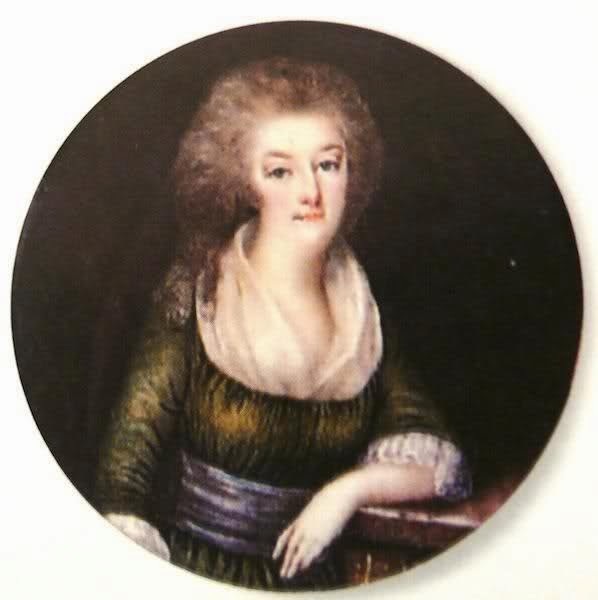 Olivier Blanc, Portraits de femmes : Artistes et modèles à l'époque de Marie-Antoinette (2006), p.166-8. "François Dumont, peintre miniaturiste de la reine" , Versailles forum post dated 5 Feb 2012. Henry de Chennevières, "François Dumont, Miniaturiste de la reine Marie-Antoinette", Gazette des Beaux-arts, 1er semestre 1903, pp.177-192.